2 Double Bedrooms, Refitted Bathroom and Kitchen/Diner, Lounge, Driveway, Carport & Garage, Front & Enclosed South Facing Rear Garden. Enjoys Gas CH, Double Glazing & Vacant Possession A modern semi-detached bungalow built by Paterson of cavity wall construction under a tiled, felted and insulated roof, situated on the level within the sought after village of Hutton. The accommodation enjoys gas central heating, double glazed windows, conservatory and south facing rear garden. Hutton is located approximately 5 miles from Weston-super-Mare and enjoys a good range of village amenities including shop, pub, church, village hall, primary school and bus service into Weston. The property is being sold with vacant possession. ENTRANCE HALL Radiator, shelved cupboard housing the gas fired combination boiler supplying hot water and central heating, telephone point and loft access with pull-down ladder. LOUNGE 13' 10" x 11' 8" (4.22m x 3.56m) plus recess. Feature fireplace with timber surround, marble inset and hearth, gas point, double radiator, TV point, telephone point, UPVC double glazed leaded light window to front. CONSERVATORY 11' 9" x 6' 0" (3.58m x 1.83m) UPVC double glazed windows to three sides, UPVC double glazed door to the garden, radiator, lighting and power points. BEDROOM 1 13' 2" x 10' 1" (4.01m x 3.07m) UPVC double glazed leaded light window, radiator, range of built-in wardrobes. BEDROOM 2 13' 0" x 8' 9" (3.96m x 2.67m) UPVC double glazed leaded light window to front, radiator. 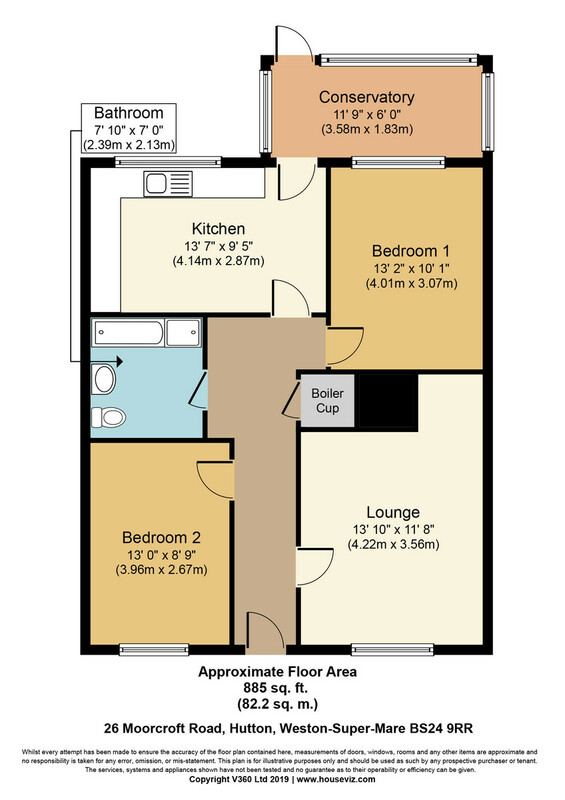 BATHROOM 7' 10" x 7' 0" (2.39m x 2.13m) Refitted with a modern suite comprising panelled bath with shower attachment, shower cubicle with drencher shower and glazed door, pedestal wash hand basin with mixer tap, low-level WC, extensively tiled walls, radiator, spotlighting, UPVC obscure double glazed side window. OUTSIDE Front garden laid to lawn with chipping stone and shrub borders, wrought iron double gates allowing access to concreted driveway to the side of the bungalow with parking for approximately 3 cars and leading to carport and garage. GARAGE 16' 0" x 8' 0" (4.88m x 2.44m) approx. With up-and-over door, half glazed door to garden, light and power. To the rear of the garage is a lean-to store. REAR GARDEN The rear garden is enclosed and south facing, measuring approximately 34'6" (10.52m) from the conservatory to the rear fence x 24'9" (7.54m) excluding the garage and is predominantly laid to level lawn with paved patio, further chipping stone patio, flower and shrub borders and a timber garden shed.